Lauren Halsey in her Los Angeles studio, 2018. We often speak of space—who owns it, who takes up too much of it, how to celebrate it, and how to divest it of subjugation and imbalances of power. Lauren Halsey has always intervened in these questions in her examination of architecture, history, and Black culture in Los Angeles. She says: “I’ve always questioned who’s designing the architecture I live in, as well as the architectures that define a neighborhood. I can’t separate architecture from other oppressive forces that have the ability to reinforce stereotypes, deplete the morale of a place and instigate violence.” Halsey interrupts those forces by creating monuments to Black creativity that are always in flux and announce their connection to the community from which their energy is drawn—or in Halsey’s words, remixed. 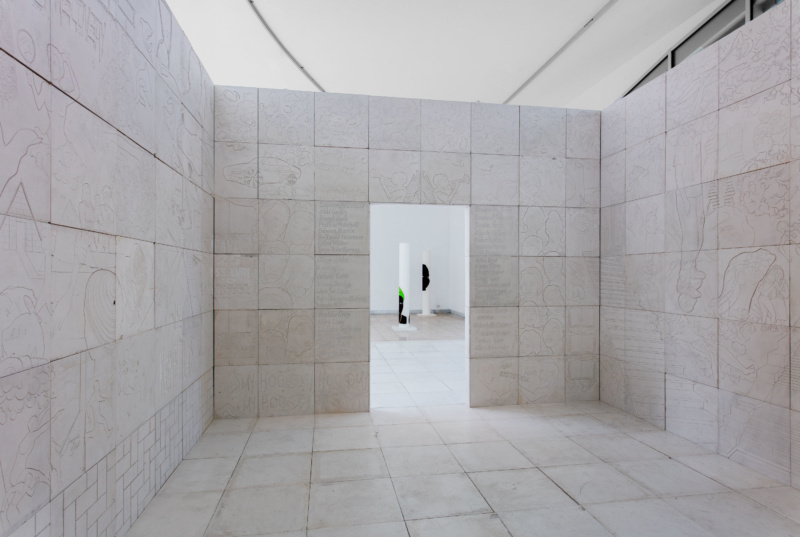 Halsey’s installation at Made in L.A. 2018 at the Hammer. Central to Halsey’s spatial interventions is a capacious investment in social documentary: “I’m interested in accumulating living archives of downtown South Central LA that include, but aren’t limited to, local heroes, signage, logos, mix CDs, celebrations, menus, incense and oils, party flyers, gang tags, figurines, superhero groups, tattoos, hairstyles, bus routes, city blocks and local businesses.” Halsey’s work is therefore an always-mobile assemblage of banal and extraordinary elements of community life that coalesce into an undeniable presence. 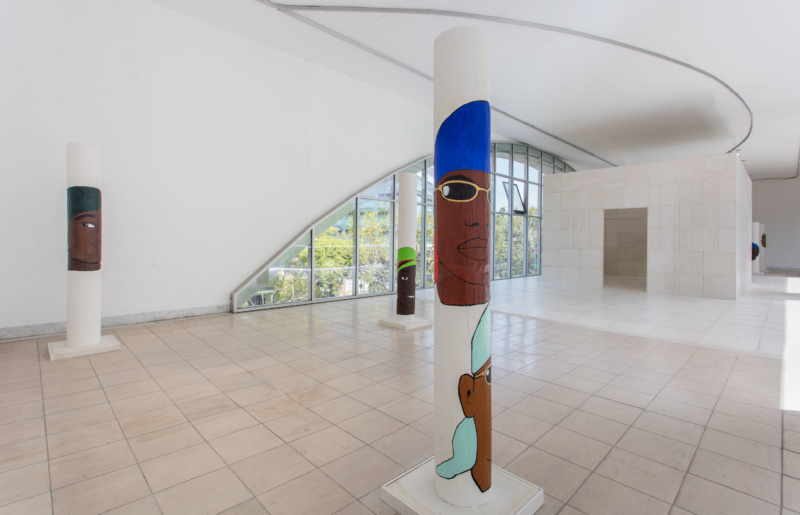 It is no wonder that Halsey named an important project at MOCA’s Grand Avenue location “we still here, there.” Her work implies duration and fragility simultaneously, which creates a space for the endless combination and recombination of cultural narratives.